For anybody looking to ski an undiscovered Swiss resort, complete with a short transfer time and guaranteed year-round skiing, Les Diablerets is a must! 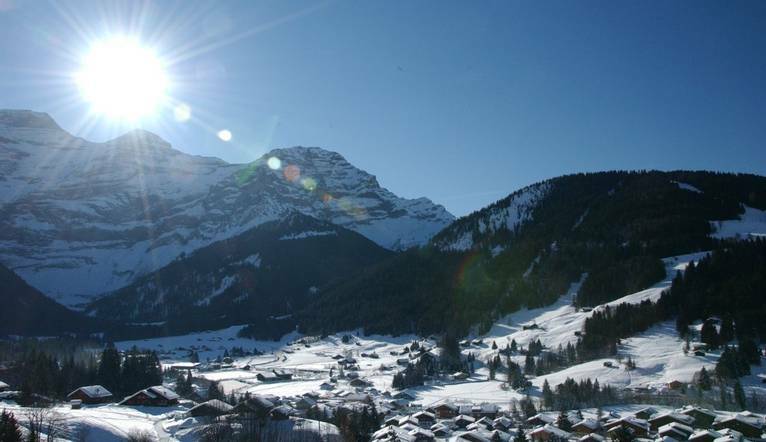 Join us for a ski holiday to remember in the charming and beautiful resort of Les Diablerets, which lies in the heart of the Vaud Alps in Switzerland. Located just over an hour away from Geneva, this beautiful “chocolate box” village enjoys a stunning setting, and is overlooked by the enormous Glacier 3000 ski area – meaning the resort can guarantee year round skiing. Loved by the Swiss, it’s a great base for skiers, lying within easy reach of several different ski areas, all of which are covered by the region’s Alpes Vaudoises ski pass. For a complete change, head to the nearby resort Leysin. Lake Geneva, the largest lake in Central Europe lies just below Leysin Village and on a clear day we may be able to see the Eiger and the Matterhorn. The area offers pistes of all grades served by an excellent interlinking lift and transport system so there are some superb skiing days out to be had. After a hard, but fun day out on the slopes, its time for some après-ski! There are a variety of bars and cafés to try in this welcoming Swiss village, as well as a disco, ice skating, curling, snow-shoeing and a long toboggan run for anybody looking for an extra adrenalin rush. Intermediates can enjoy the slopes in the Meilleret ski area, accessible by a chairlift 500m from our hotel and from here we can ski on to the more extensive and challenging pistes of the neighbouring resort of Villars. Alternatively, the Isenau gondola, served by the ski shuttle bus and within walking distance of our hotel, takes us up to a second ski area, where there are some interesting blue runs down to the village, and also a linking run to the cable car which accesses the snow-sure Glacier 3000 ski area. Here there are a variety of runs suitable for all standards of skiers as well as some amazing scenery and views to enjoy. For those who relish the challenge of a good black run, there is a long red/black slope down to the valley. Les Diablerets also has an excellent ski school if you are a beginner or are looking to brush up your technique. This was my third Solos ski trip, and they just seem to get better and better! Once again, I was made to feel welcome and part of the group - a friendly bunch of like-minded individuals. Our Tour Leader did a fantastic job throughout the trip even though it was her first trip to this resort. Well done Barbara, I hope to meet you on a trip again in the future! Good group, enjoyable skiing and a friendly hotel with an owner who was always very helpful. Built in the traditional Swiss style, our family run hotel is located close to the centre of the village and within walking distance of the Meilleret chair lift and the Isenau gondola. There is a cosy lounge area where we can gather in the evenings. Each simple but comfortable room contains satellite TV, radio and hairdryer. Free Wi-Fi is available. The transfer time from Geneva Airport to Hotel Les Sources is approximately 2 hours, depending on weather and traffic. We suggest a Group Collection to cover transfer drivers, and hotel staff of CHF20.00 per person or the equivalent in local currency. Your Tour Leader will collect this on your behalf and distribute it accordingly, thus relieving you of the burden of who, when and how much to tip. The tipping of housekeeping will be left to your individual discretion (a small amount left in your room on departure should cover this and would be much appreciated). As is customary, ‘the hat’ will be passed around for the driver and guide on all optional excursions. For any meals that are not included in your itinerary, or taxi fares, your Tour Leader can advise of an appropriate Ͽo add on. If you choose to have ski lessons, you may also like to thank your ski instructor at the end of the week with a token of appreciation.